The US Department of Health and Human Services, the American Academy of Pediatrics and the World Health Organization all recommend feeding infants breast milk exclusively for the first 6 months after birth, and also recommend breast milk continue to be part of an infant’s diet until age 1 or 2 years. In the U.S., seventy percent of mothers participate in the workforce, so workplace accommodations for nursing moms are a real concern for employees and employers alike. An employer shall make reasonable efforts to provide an employee with the use of a room or other location, other than a bathroom, in close proximity to the employee’s work area, for the employee to express milk in private. The room or location may include the place where the employee normally works if it otherwise meets the requirements of this section. An agricultural employer, as defined in Section 1140.4, shall be deemed to be in compliance with this section if the agricultural employer provides an employee wanting to express milk with a private, enclosed, and shaded space, including, but not limited to, an air-conditioned cab of a truck or tractor. If an employer can demonstrate to the department that the requirement to provide the employee with the use of a room or other location, other than a bathroom would impose an undue hardship when considered in relation to the size, nature, or structure of the employer’s business, an employer shall make reasonable efforts to provide an employee with the use of a room or other location, other than a toilet stall, in close proximity to the employee’s work area, for the employee to express milk in private. If the nursing employee’s work space meets the requirements (such as a private office), the requirement is satisfied. Another bill that proposed extensive requirements for lactation rooms was passed by the legislature but vetoed by the governor. Workplace lactation laws require employers to provide a private location, other than a bathroom, that is in close proximity to the employer’s work area. California requires the location to be free from intrusion while in use, so relevant signage is a must. 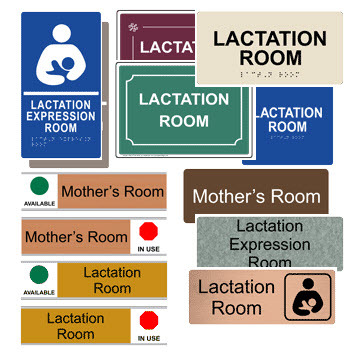 ComplianceSigns.com offers a wide selection of lactation room signs to identify these rooms for employees and inspectors. ADA Standards require that signs designating permanent rooms and spaces must have raised characters and Braille, so if you plan to create a permanent lactation room with a sign, a braille sign is a good choice. Our lactation room signs are available in a variety of styles, formats and materials, including ADA Braille, sliding engraved signs that show if the room is in use, and printed signs a many colors. California law states that every employer, including the state and any political subdivision, shall provide a reasonable amount of break time to accommodate an employee desiring to express breast milk for the employee’s infant child. The break time shall, if possible, run concurrently with any break time already provided to the employee. Break time for an employee that does not run concurrently with the rest time authorized for the employee by the applicable wage order of the Industrial Welfare Commission shall be unpaid. An employer is not required to provide break time if doing so would seriously disrupt work operations. An employer who violates any provision of this chapter shall be subject to a civil penalty in the amount of one hundred dollars ($100) for each violation. If, upon inspection or investigation, the Labor Commissioner determines that a violation of this chapter has occurred, the Labor Commissioner may issue a citation. The procedures for issuing, contesting, and enforcing judgments for citations or civil penalties issued by the Labor Commissioner for violations of this chapter shall be the same as those set forth in Section 1197.1. (c) Notwithstanding any other provision of this code, violations of this chapter shall not be misdemeanors under this code. Section 7 of the Fair Labor Standards Act (FLSA) requires employers to provide reasonable break time for non-exempt employees to express breast milk for their nursing children for one year after the child’s birth each time the employee has need to express. Employers are also required to provide a place, other than a bathroom, that is shielded from view and free from intrusion from coworkers and the public, which may be used by an employee to express breast milk. Employers with fewer than 50 employees may be exempt if compliance would create undue hardship. The FAA now requires all large- and medium-sized airports to provide a clean, private, non-bathroom space in each terminal for the expression of breast milk. Many states have additional laws related to breastfeeding and expressing milk in the workplace. The FLSA requirements do not preempt State laws that provide greater employee protections. In addition, San Francisco employers must create a written lactation accommodation policy that is provided to employees upon hire, included in an employee handbook and given to any employee who inquires about or requests parental leave. Resources, including model forms, are available from the San Francisco Department of Public Health. The New York City Council recently passed a bill to require employers covered by the Human Rights Law to provide lactation rooms, as well as refrigerators, in reasonable proximity to work areas for the purposes of expressing and storing breast milk, but the mayor did not sign it. Puerto Rico requires shopping malls, airports, public service government centers and other select locations to have accessible areas designed for breastfeeding and diaper changing that are not bathrooms. Louisiana’s law requires state buildings to provide suitable areas for breastfeeding and lactation. Some states have laws requiring schools to provide reasonable accommodations to lactating pupils, and there are many more laws addressing public breastfeeding.